For tickets to Monday’s Faneuil Forum with Professor Michael Sandel, click here. Michael Sandel joined the Government Department in 1980 to teach political theory largely on the strength of a dissertation that boldly critiqued the ideas of John Rawls, then a towering figure both at Harvard and in the field. Since then he has grown to be among the most influential political philosophers of his era, and one of the country’s most visible public intellectuals. Sandel is perhaps best known for creating and teaching “Justice,” an overview of political philosophy that became one of the most famous and popular undergraduate courses in Harvard’s history. A winner of the Harvard-Radcliffe Phi Beta Kappa teaching prize, Sandel is a master of the Socratic method, blending introspection and engagement with bold provocations and some well-honed showmanship about many of life’s big philosophical questions. Sandel these days offers “Justice” as a free online class; delivers TED talks and lectures regularly on PBS and the BBC; and speaks before rock concert-sized crowds in august settings around the world, from the Library of Congress to British Parliament to the Sydney Opera House. His books have been translated into 27 languages. Michael Sandel is the Anne T. and Robert M. Bass Professor of Government at the Faculty of Arts and Sciences. Q: Tell me a little about your life growing up. A: I spent the first 13 years of my life in Hopkins, Minnesota, a suburb of Minneapolis. Then my family moved to Los Angeles, where I spent my high school years. I attended Palisades High School, a public high school in West Los Angeles. From the front quad, you could see the Pacific Ocean. Q: I imagine that must have been quite a culture shock, going from Minnesota to Southern California in the mid-1960s? A: It was a radically different culture from Minnesota, though this only dawned on me gradually. Minnesota was steeped in a strong civic tradition that produced Hubert Humphrey, Eugene McCarthy, Walter Mondale, Garrison Keillor. Southern California was atomized and rootless by comparison. But the weather was agreeable and I loved going to high school there. For me, at the time, the most wrenching shift was following the Minnesota Twins, my baseball team, from a distance. Q: What kind of kid were you? I understand you were class president at one point. A: Yes. Pali High, as it was called, was highly competitive and heavily tracked, to an extreme that I don’t think was healthy or desirable. All of the kids in the AP classes found themselves taking most all of their classes together. There was intense competition among the students, more than I’ve encountered at any time since, in college or in graduate school, for that matter. The student body was divided into several groups — the academically oriented kids; the kids who were mainly involved in sports; and the so-called surfer types who would cut class to go surfing in the middle of the school day. So when I ran for student body president, I had to find ways of working with this disparate group of students. Q: How did you manage that as the kid from Minnesota? Did it help you that you were from somewhere else? A: I’m not sure that it did. What helped me was I had run unsuccessfully for an office the previous year. The lesson I learned was not to give an earnest speech about reforming the structure of the student government, but instead, to give a speech that addressed things students cared about, with some humor. 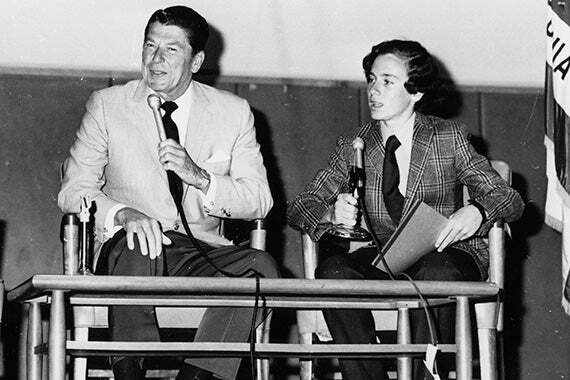 Q: Ronald Reagan spoke at your high school. Was that your doing? A: Yes. The idea grew out of my interest in politics and in debating. I was on the high school debate team. It so happened that Reagan lived in the neighborhood, in Pacific Palisades. He was governor of California at the time and a rising star on the conservative wing of the Republican Party. The student body was uniformly left-liberal; almost no one in the school shared Reagan’s politics. I sent a letter of invitation to his office in Sacramento, and heard nothing. Then my mother read in a magazine that he was fond of jelly beans. So I went out and bought a six-pound bag of jelly beans, put them in a white box with a bow and an invitation, and delivered it to his home in Pacific Palisades. Q: You were able to walk right up his driveway? A: Not exactly, because this was 1971. Reagan was a vocal proponent of the Vietnam War, and a frequent target of protests, especially by UCLA students against the war. And so, as I approached his driveway, I encountered a guard booth with state troopers who had German shepherds. And I was afraid of dogs under the best of circumstances, much less growling German shepherds. The guards stopped me and wanted to know what was in this square box, which looked very suspicious. I said jelly beans. They looked at me skeptically, examined and squeezed the bag. Finally, after deciding that my package was innocent enough, they let me deliver it to the front door. A few days later, the governor’s office called the school and said he would come. Q: What was your pitch to him? A: Simply that we’d be honored to hear from him, that here was an opportunity to engage in discussion with students from his own neighborhood who, in many cases, disagreed with his views. Here was an opportunity for dialogue and discussion. A: The only condition they set was we could not announce the visit in advance, because they didn’t want to attract demonstrators from neighboring universities. On the day of the event, all 2,000 or so students gathered in the auditorium. I sat up on a stage with him. Now, I was quite confident of my debating skills, overly confident. I thought that this would be an easy matter. I had prepared a list of the most challenging questions that I could muster. Q: What kinds of questions? A: They were all about issues on which he and we disagreed. He was for the Vietnam War; we were against it. He was, at that point, against the United Nations; we were in favor of it. He was a critic of Social Security, and of welfare; we were in favor of them. He was against 18-year-olds getting the vote; we were very much in favor. And so, issue by issue, I asked him the strongest, toughest questions I could think of. But I didn’t lay a glove on him. He responded — graciously, with easy humor, in a reasoned way — to every question I put to him. Then, about halfway through, we opened the floor to questions, and the same thing happened. Few if any of the questions reflected agreement with his views, but he was able to respond to each question in a surprisingly disarming way. When the hour came to an end, I thanked him for coming; he thanked us for having him. He left through the back door of the auditorium, got in his car, and off he went. None of us, least of all me, were quite sure what had happened, because on the one hand, he hadn’t persuaded us on any of these issues. And yet, because he took us so seriously, or so it seemed, and because he responded so respectfully and also with good humor, we found that we had almost been charmed — this despite the fact that we thought of ourselves as quite rigorous, demanding, hardheaded, politically sophisticated high school students. A: That here was a figure who, though he held political views diametrically opposed to mine — to ours — he listened to the questions, he took them seriously, he took us seriously, and he addressed us. He tried to reason with us, and he did it with humor. There was something winning in that, even though he didn’t persuade us. Nine years later, these same skills would lead him to the presidency. Q: What did you think you were going to study in college and beyond? Did you have a career path in mind at that point? A: No, I didn’t have a career path in mind, though I thought maybe I would enter politics. When I finished high school, I knew I was interested in history and in politics, and so in college — I went to Brandeis — I majored in political science. Q: What was the draw for you at Brandeis? A: I liked the fact that it was a small, liberal arts research university that provided easy access to faculty members and in a relatively small-scale setting. I was very happy at Brandeis and got a wonderful undergraduate education. I was also very interested in economics and the humanities, in addition to politics. But I did not study much political philosophy until graduate school. I tried taking a course in political theory my freshman year, but I couldn’t make much sense of it. They gave us these books by famous thinkers of the past — Plato and Aristotle — and I found them daunting and difficult and abstract and remote from the things that interested me. That made me think that political philosophy was not for me, that I was more interested in concrete, practical things. Most of what I studied during undergraduate years were political institutions, history, economics, and the humanities. I wrote my undergraduate thesis on the decline of the political party in the United States. It was not on a philosophical topic; it was on a very concrete, empirical, historical topic. During college, I worked as a journalist. Political journalism fascinated me. I was news director of the campus radio station, which didn’t have a very strong signal, but it did provide me with a press card. And with this press card I was able, during the New Hampshire primaries of the 1972 presidential campaign, to go up to New Hampshire and follow the candidates around. That was the year that George McGovern won the Democratic nomination. In New Hampshire, he was an outsider and a long shot. I remember traipsing around shopping malls in New Hampshire with George McGovern and my little cassette recorder, chatting with him, interviewing him. Edmund Muskie, a senator from Maine, was the front-runner. A large media scrum followed him, but few reporters were covering McGovern at the time. That summer, the Democrats held their national convention in Miami Beach, Florida. On the strength of my college press credentials, I covered the Democratic Convention. I was in the convention hall when Senator Ted Kennedy introduced McGovern as the party’s nominee. McGovern gave his acceptance speech around 2 a.m. The Democratic Party had not yet learned how to manage its convention for prime-time television. Q: And, of course, that turned out to be a terrifically exciting and historic election. A: Yes. And then came Watergate. Richard Nixon was re-elected in a landslide over McGovern. The summer between my junior and senior year, I applied to every newspaper I could think of for a summer internship. The Houston Chronicle offered me a job in their Washington bureau for the summer. I had never been to Houston, but the idea of spending the summer in the Washington bureau was, for me, a dream come true, because this was the summer when the House Judiciary Committee was holding hearings into the impeachment of Richard Nixon. Since it was a relatively small bureau — I think five reporters — I was able to sit in on the impeachment hearings in Congress and also in the Supreme Court hearings. Nixon had kept tapes of his conversations in the Oval Office. When this was discovered, the special prosecutor investigating the Watergate scandal subpoenaed them. The Supreme Court had to decide whether Richard Nixon would have to give over the tapes, and I was able to sit in on the case. Q: You were in the courtroom? A: Yes. Because seats were in such demand, most newspapers were paired and had to take turns sharing a seat. My newspaper was paired, I think, with a Detroit paper. I had to alternate every half-hour with the reporter from that Detroit paper. So I was only in attendance for half of the oral arguments. I still have the articles I wrote in a trunk in my attic. Q: Did you realize at the time that you were witnessing history? A: Yes, that was part of the thrill of it. As the House Judiciary Committee held its hearings, the committee released volume after volume of factual background: who said what to whom on what date (because that was at the heart of the scandal), how much did the president know about the money being offered to prevent the participants in the break-in from speaking, and so on. The House Judiciary Committee would release these documents periodically, usually late in the day. I was a Watergate junkie and knew exactly on what date Haldeman and Ehrlichman had said what to John Dean, and so on. So I offered to go pick up the documents for our office. The evidence filled maybe a couple dozen volumes and they released two or three or four at a given time. I was a young kid; I had nothing better to do, so I was sent. I would collect our paper’s set and would go to my apartment on Capitol Hill and just pore through them, skimming for any new revelation. You have to know the background to know what you’re looking for. You might be going through a thousand pages looking for one or two new nuggets. For me, this was a dream come true. I was hoping the impeachment would play out all the way to a vote in the Senate so I would be able to witness the full, historic unfolding. But the committee’s timeline lagged, and by August, I knew I had to go back to school in September. A: I began rooting for a resignation, which at least would bring the story to a conclusion while I was still there to witness it. Sure enough, Richard Nixon obliged me; he decided to resign once the House voted to impeach him, rather than face a trial in the Senate. And so Gerald Ford, who was then his vice president, assumed the presidency before a joint session of Congress, which I was able to witness from the House gallery. That was in August, just before I had to return for my senior year in college. Q: That may very well be the greatest summer internship ever. A: I certainly thought so. Toward the end of the summer, I was sitting with my bureau chief, a man in his mid-50s. And he was musing that maybe he should retire now, because the story would never be this good again. So I said, “Are you telling me that if I go into this career, it’ll all be downhill from this summer’s experience?” He laughed and conceded that there might be something to that. He did let me keep the volumes of evidence as a souvenir. I still have them in my study at home, a full set of volumes from the House Judiciary Committee’s impeachment of Richard Nixon. Q: That must have been a huge letdown, returning to classes. Were you leaning toward a career in journalism? A: I was still very drawn to it, but I didn’t really know what I wanted to do ultimately. Political journalism was one possibility. I thought maybe I would go into politics and run for office. Or maybe go to law school, as many of my friends were doing. Or maybe become an academic. I didn’t really know what I wanted to do. And then I had an opportunity to postpone the decision, when I got a fellowship to study at Oxford. It was a welcome opportunity to think and read more without having to make that decision. Q: I don’t think too many people have a Rhodes Scholarship as their fallback plan. Were you surprised by your selection? A: I was completely surprised. That hadn’t ever been a part of a plan. I never even thought about applying for a Rhodes Scholarship or anything of the kind until a professor of mine, a few weeks before the deadline, said, “Why don’t you put in for this?” It had never been an ambition or a plan or anything I’d even thought about. Today there is such coaching and preparation and advanced planning that people devote an inordinate amount of time and mental and emotional energy to positioning themselves to apply for various scholarships and fellowships. This worries me, and I say this having served for many years on the Rhodes selection committee after I began teaching. I think it distorts, in many ways, the exploratory character of undergraduate years to be so focused and so driven toward preparing oneself to apply for this or that opportunity or career path. Q: Let’s talk about your time at Oxford. You studied with some of the preeminent political philosophers of the era: Alan Montefiore, Charles Taylor, and Ronald Dworkin, among others. What prompted you to abandon journalism and pursue political philosophy? A: As an undergraduate, I hadn’t studied much political philosophy. I had focused more on political institutions, history, and economics. I thought I would spend my first term at Oxford reading up on philosophy, as background to my more concrete, practical concerns. It turned out one term wasn’t quite enough to read my way though the whole history of political thought [laughter]. So, I spent a second term, and the more I read, the harder it was to extricate myself. Before I knew it, I was immersed in political philosophy and in love with it. Q: Was this independent study or course work? A: In those days, an Oxford graduate education was very loosely structured, much more so than American graduate programs and much more so than Oxford is today. I wound up spending four years in Oxford. The first two-and-a-half were essentially spent taking tutorials, studying various philosophers. There was no formal coursework, but there were tutorial sessions where I would sit, sometimes with a tutorial partner or with a teacher, and we would read and study. There were also a great many seminars. I studied most closely with Alan Montefiore, who persuaded me I had to study Kant, whose relevance to my concerns was not immediately apparent, at least not to me. During my first term, I took a tutorial in philosophy and also began work on an economics project, a paper about equality and social welfare functions: Could a concern for equality be built into standard economic models or was a concern for equality a separate, philosophical matter? I was trying to work this out as an economics paper showing how a concern for equality could be built into these social welfare functions. My economics tutor thought it was a promising project that might develop into a dissertation. The philosophy tutor said, “No, if you’re really interested in equality, you have to read Kant and you have to do philosophy seriously.” They kind of had a tug-of-war over my intellectual fate, and I didn’t know which side to join. In the evenings, my friend and I would work on the economics paper. And in the mornings, because he slept late, I would read these philosophy books. When I returned to Oxford, I did more philosophy tutorials. Those books and that experience began to make political philosophy inescapable for me. Q: What was it about Kant and the others that took hold of you? A: Here were attempts to work out, philosophically, the meaning of justice and morality. I’d been drawn to economics because of its apparent rigor, but I began to realize that it could not possibly address the normative questions that interested me: about justice, rights, equality, and the common good. I realized then that only by studying philosophy could I really think my way through these questions. Q: Because the tools of economics simply weren’t going to get you there? A: Yes. That very promising economics paper still sits unfinished in my attic [laughter]. My dissertation wound up being about a critical analysis of the philosophy of liberalism that emerges from the thinking of Kant and John Rawls. Q: So is it safe to say that after that first year at Oxford, journalism had faded as a career path? A: No, I hadn’t really decided. After my first year at Oxford, I did spend one more summer in journalism, as a writer at Time magazine in New York. It was much less exciting than my experience in Washington had been. At Time, in those days, the writers would sit in New York and write the articles based on the reporting done by somebody else. There was a radical division of labor. You would write your article, and put it in a pneumatic tube in the wall. It would go to an editor and then a higher editor and then a still higher editor. And you would sit around, sometimes for days, until the editor would send you back some version of what you had written. It was a bizarre and not entirely satisfying experience, and it helped confirm that journalism was not for me. After three years, which is what the Rhodes supported, I still hadn’t finished my dissertation, so I spent a fourth. I got a one-year job teaching political theory at Oxford, replacing someone who had gone on leave, while working to finish my dissertation. Q: Your dissertation was a critique of Rawls, who was a towering figure in the field and here at Harvard. What was your relationship with him like? Did your criticism create any tension for you? A: I came here to teach in 1980. I had never been at Harvard before, as an undergraduate or as a graduate student. While that’s relatively common these days, it was less common in those days, when junior faculty were often hired from among the graduate students here. There had been three senior political theorists in the Government Department when I was hired: Judith Shklar, Michael Walzer, and Harvey Mansfield, who is here today. Judith Shklar was a friend of John Rawls, who taught in the Philosophy Department. She had told him about my work and that I was coming. Shortly after I arrived, the phone in my small basement office in Littauer rang. The voice on the other end said, “Michael Sandel?” I said, “Yes?” He said, “This is John Rawls. R-A-W-L-S,” as if I might not recognize the name! He said he heard that I had just arrived and was calling to see if I wanted to meet for lunch. And we did. He was unfailingly generous and considerate toward me, despite the fact that I had taken on his work. Q: Besides Rawls, who else was important in the field when you started teaching? A: Charles Taylor was then and remains a major figure in political philosophy. During my second year in Oxford, he arrived to take up a chair in political theory. He had a tremendous influence on my thinking and I learned a great deal from him. He had just written a big book on Hegel at a time when, in the Anglo-American world and certainly in Oxford, little attention was given to continental philosophy. Most of the debates at the time were fairly circumscribed arguments between utilitarianism and rights-oriented views. Other figures whose teaching influenced me at Oxford include the philosopher Stuart Hampshire, with whom I studied Spinoza; Ronald Dworkin, who was giving lectures in jurisprudence at the time; and Amartya Sen, who was teaching welfare economics. That cluster of figures — Alan Montefiore, Charles Taylor, Ronald Dworkin, Stuart Hampshire, Amartya Sen — were for me as a graduate student a powerfully formative influence in those Oxford years. Here at Harvard, Judith Shklar, Harvey Mansfield, and Stanley Hoffmann were senior colleagues I looked up to and learned a great deal from. Q: How would you describe your own views? A: My dissertation (which became my first book, “Liberalism and the Limits of Justice”) was a critique of a version of liberal political philosophy that draws upon Kant and that finds its fullest contemporary expression in John Rawls. The central question was this: Is it possible to define principles of justice and individual rights in a way that is neutral toward competing conceptions of virtue and the good life? A central idea of Rawls’ political philosophy is that in pluralist societies like ours, where people disagree about the meaning of the good life, we should not embody in the Constitution, say, or in law, any particular conception of the good life. In seeking a just society, we should seek a framework of rights that is neutral with respect to people’s particular moral and spiritual convictions. My argument in “Liberalism and the Limits of Justice” is that, although this is an understandable aspiration, it is not possible to come up with principles of justice and rights that are truly neutral toward competing conceptions of the good life. It’s not possible and may not even be desirable. This was a debate that played itself out in the 1980s and ’90s within political philosophy. Q: Some have referred to your ideas as civic republicanism or communitarianism. Are those accurate labels? A: I’m uneasy with the label “communitarian.” One of the issues in the debate was how to conceive our identities as persons and as citizens. In his book “A Theory of Justice,” Rawls argues that we should think about principles of justice by imagining that we are behind a veil of ignorance. We don’t know who in particular we are. We don’t know whether we are strong or weak, healthy or unhealthy, rich or poor. We don’t know our race, ethnicity, religion, or gender. Nor do we know our particular conception of the good. What principles would we choose to govern our lives together if we didn’t know who in particular we were or what in particular we valued? Thinking about justice in this way respects persons as free and independent selves, capable of choosing our own values and ends, not defined or encumbered by identities given by history, tradition, or inherited status. This was Rawls’ very powerful idea. Those of us who were critical of that way of thinking about justice argued that we miss something of moral and civic importance if we ask people to screen out or set aside their life history, their traditions, their culture, their moral and religious allegiances. We miss something if we insist that people leave those convictions outside when they enter the public square to debate the meaning of justice and rights. So I argued, and others argued, that when we reason together as citizens about the meaning of justice and rights, we should not set aside our moral and spiritual encumbrances, traditions, and convictions. Instead, we should draw upon them, and engage with the conceptions of the good life our fellow citizens espouse. Some people have called this view a communitarian critique of liberalism. I’ve resisted that label because I think it’s misleading. It implies that justice is whatever the community at any given moment considers justice to be. But this leads to pure majoritarianism. Consider the segregated South. Just because a great many people in the community held segregationist beliefs did not make those beliefs just. Justice has to be able to criticize existing practices and beliefs. It shouldn’t valorize whatever values happen to prevail in a community at any given time. That’s why I resist the communitarian label. The real issue is whether it is possible to reason about justice without drawing upon conceptions of the good life. And my answer is no. When we reason about justice, we reason as encumbered, or situated selves, defined in various ways by our attachments, allegiances, and conceptions of the good life. Q: Did you ever confront moments of real self-doubt, when you questioned whether you’d be able to make a mark in the field? A: Not really. I say this not out of hubris, but because I didn’t think about it in these terms. I sensed from the start that I didn’t see myself engaging in political philosophy as a purely abstract endeavor. When I began teaching, I had a vivid memory of my frustrating experience as a freshman in college, being handed these canonical books in political philosophy and finding them dull and dry and distant and abstract and remote. Eventually, I fell in love with these books, but only when I began to see how they spoke to things I cared about. And so I’ve always wanted to connect philosophy to the world, to use philosophy as a way of illuminating and making sense of the debates and dilemmas we confront — in politics and in our everyday lives. This persisting interest in relating philosophy to the world prompted me to teach in a way that didn’t just consist of me lecturing at a podium, but putting questions and provocations and challenges to students and inviting them to respond during the lecture. 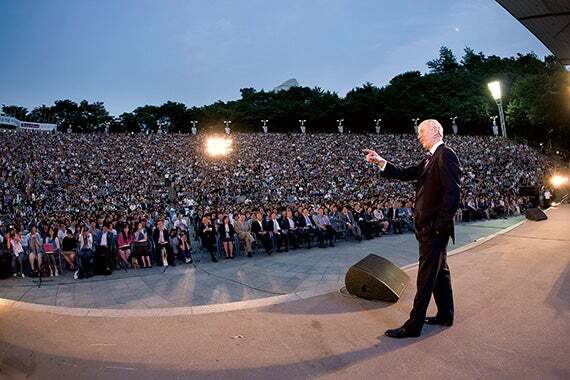 Sandel’s passion for political philosophy has found equal passion among crowds around the world, in this case at a lecture in Seoul before an audience of 14,000. Q: What’s your finest achievement as a scholar? A: I’m not sure I’m the best judge of that. It may be “Democracy’s Discontent: America in Search of a Public Philosophy,” which offers an interpretation of the American political and constitutional tradition. It is partly historical and partly philosophical. The book tries to identify the shifting conceptions of citizenship and freedom implicit in American legal, constitutional, and political practice, from the founding of the republic to the late 20th century. “Democracy’s Discontent” is the second half of the project I had in mind when I was writing my dissertation. It shows how the version of liberalism and of rights I criticize in “Liberalism and the Limits of Justice” came to inform American political practice, and how the “unencumbered self” came to define the self-image of the age. It tries to show how the demand that we set aside our moral and spiritual convictions when we enter the public square leads to the hollow, impoverished public discourse we have today, and to the widespread frustration with democracy. The book contrasts the consumerist idea of freedom prevalent today with a more demanding civic conception of freedom that finds expression in moments throughout the American political tradition. According to the civic conception, to be free is more than a matter of pursuing my interests unimpeded, or satisfying my desires, whatever they happen to be. It is to share in self-government, to deliberate about the common good, to have a meaningful voice in shaping the forces that govern our lives. This more demanding conception of freedom connects with the civic republicanism you mentioned earlier. Q: Did you see a change in students in the time you taught “Justice”? A difference in their questions, their answers, or even their engagement on certain issues? Q: A lack of recognition that good fortune may also play a role in their lives? A: Yes, exactly. Having gone through what approaches a psychic war zone of intensively competitive, pressure-packed high school years, it’s hard to emerge from that successfully without having absorbed the assumption that it’s all you, it’s all one’s own effort. Something similar is unfolding in society at large. As the gap between rich and poor has widened, there is a tendency in our society, not only for the students gathered in Sanders Theatre, for those on the top to think, “I’ve landed on the top because I deserve to be here.” One of the central questions that I invite students to reflect on is: Is that true? What is the relation of merit and luck in the way rewards are distributed, whether it’s admission to Harvard College or winding up among those who reap enormous rewards in our society? I do an experiment with the class. I point out that some psychologists claim that birth order plays a big part in striving and the work ethic. And I ask, just for the fun of it, how many here are first in birth order? A lot of hands go up, something like 75-80 percent. As students look around and see how many hands are up, there is an audible gasp. Q: That it’s so many? A: Yes. And in that gasp, there is a moment of reflection that begins. This is just one way of prompting students to reflect not only on what’s fair in society as a whole, but also connecting their own life experience to those questions. Q: To what do you attribute the enduring popularity of “Justice”? A: I think students want to be active participants in learning, especially in a field like political philosophy. And so, I think teaching by involving students in active discussion is a way of inviting and challenging and inspiring the students to think actively and critically about their own views and to think critically about the views of the philosophers we study. I also find there is a great hunger — especially, but not only, among students — to engage in serious reflection on big, ethical questions that matter politically, but also that matter personally. So I’ve always tried to connect the philosophical concepts and texts with the dilemmas and experiences that students encounter every day. Students want an opportunity to reflect critically on moral and ethical questions, to figure out what they believe and why. The undergraduate years are a rare and precious moment for this kind of inquiry and reflection. Students sense this, and they respond to it, and they want it to be part of their undergraduate education. Q: That’s why you go to college. A: Yes, this is what it means for undergraduate education to be transformative, to reach fundamental questions, including moral and political and spiritual questions: Figuring out what one believes and why. To me and to many of the students I’ve taught, this is at the heart of what an undergraduate education should be. Q: What do you hope students have taken away from your teaching? A: There are lots of things that students can do with a critically informed awareness of the ethical dimensions of their lives. I don’t think it points in the direction of any particular career or vocation, but it’s an orientation to life, it’s an orientation to the world. And if the course goes well, students never view the world and their place in it in quite the same way. Whatever their careers or their pursuits, they become alive to moral and civic possibilities and perplexities they might not have noticed before. Q: In the last few years, you have been traveling around the world, talking to all kinds of people, not just students. How do you account for your popularity abroad, particularly in places where there isn’t a strong Socratic tradition and exposure to the philosophical ideas you raise is limited. What do you think you’re tapping into with these audiences? A: The first thing I notice is that there is a tremendous hunger around the world to engage in reasoned public debate about moral and spiritual questions. In many places this reflects a certain emptiness in public discourse, an unwillingness or inability on the part of political parties or politicians to create forums for these kinds of discussions in public. It also reflects, in many parts of the world, an educational system that relies heavily on hierarchical, top-down, passive learning. Lecturing at students, rather than engaging them as active participants in learning. So it’s a novelty, this way of lecturing and promoting public dialogue and discussion. It’s a novelty in places in East Asia, but it’s also surprisingly novel in many Western democracies. Even if one looks at American democracy, I find traveling around the U.S., there is a widespread frustration with the terms of public discourse, particularly with the emptiness, the hollowness, of it. What passes for political discourse these days consists either of narrowly managerial, technocratic talk or — when passion enters — shouting matches on talk radio and cable television, partisan food fights on the floors of Congress. People want politics to be about big things, including moral and spiritual questions. People want a public life of larger meaning than the established parties and ratings-driven media provide. Q: Do you have a sense of your plans for the next 10 or 15 years? A: I would like to keep everything going at once — research, teaching, and using new technology to promote public discourse around the world. All of these activities feed and enrich one another. I would like to continue to experiment with new technology to create platforms for civic education and public dialogue across national boundaries and across cultures, and I’m exploring a number of ways of doing that. A few years ago, I did a “global classroom” experiment that connected my students in Sanders Theatre with students in China, India, Japan, and Brazil, for a series of live, video-linked discussions of justice. I’m currently working with the BBC to create a series of video-linked global discussions with participants from over 30 countries. The program, called “The Global Philosopher,” will explore the philosophical questions underlying our most difficult political debates. Our first topic will be immigration, and the moral status of national borders. I think there are exciting new opportunities to use technology to create a truly global civic education for the benefit of Harvard students, and also for the benefit of students and learners wherever they may be, wherever they may live. For me, the whole point of making my course freely available online was to show that higher education can be a public good, not just a private privilege. One of the most gratifying responses came in an anecdote from a colleague who said he was traveling in China and got into a taxicab in Beijing. When the cab driver asked him where he was from, he said, “Cambridge, Massachusetts.” And the taxi driver said, “Oh, I’m taking a Harvard course. It’s a course on justice. And my entire family takes it with me. We’re studying all these philosophers.” This is a taxi driver in Bejing! That, to me, makes all of this worthwhile. “The experience of home is so fundamental to human existence,” says Micaela Connery, M.P.P. '16. “I want to think about inclusive housing for people with disabilities that’s integrated into urban communities."